One of the things I cooked recently was roasted squash. I halved delicata and acorn squash, scooped out the seeds and sliced each into 1/2 inch slices. Then laid on a baking sheet, I drizzled everything with a little olive oil, maple syrup and a sprinkle of curry powder before roasting them until soft. When I brush this maple-curry mix on salmon my family eats it up. And butternut squash soup is usually a hit, so I thought this would be a winner, too. My husband and I thought it was great, but kids did not agree. So I had more leftover squash than anticipated. But not to worry, I often use leftovers to make salad! 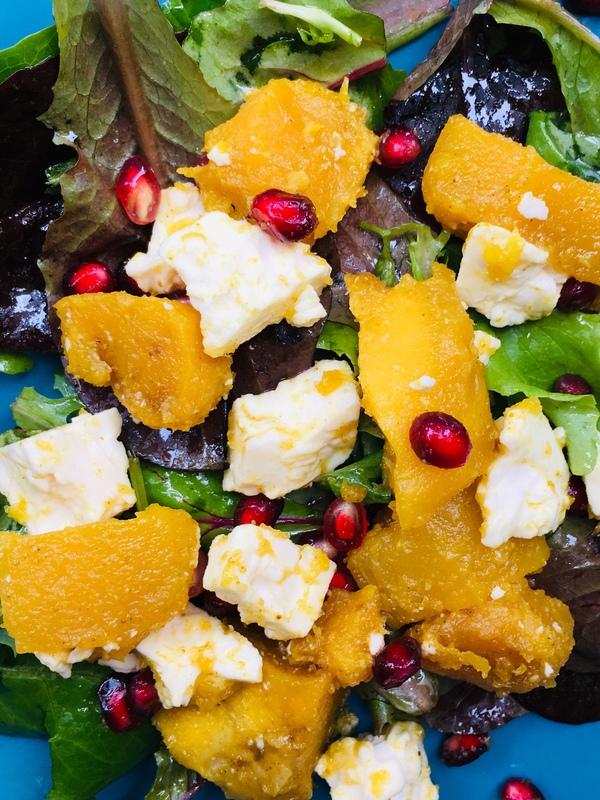 And I did: maple-curry squash, feta and pomegranate seeds over mixed dressed greens. The juicy pomegranate seeds are fresh and tart and crisp where the squash is soft and sweetened by the maple syrup that’s cooked down during the roasting. Then the saltiness of the feta… so complimentary to the warm spices of the curry. I don’t know how my little ones didn’t love this! But I still recommend it if you like squash, curry, maple syrup, salad or trying new things.